Ken Levine is still waiting on 2K Games and Sony to "make a match." 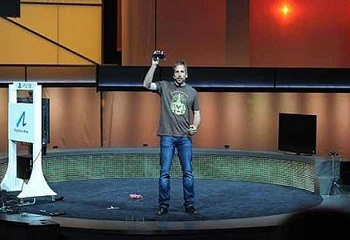 While offering nothing more than a confirmation of the project's existence, Ken Levine's 2011 announcement of a Bioshock game for Vita set player's minds ablaze with thoughts of mind bending tales they could potentially play on the go. The two years since however, have been sadly bereft of further details, with Levine commenting only to confirm that the project could possibly still go forward in the future. Now, Levine has offered up another brief update on Bioshock Vita and, unfortunately, the game seems to be much in the same spot it was the last time he commented on it. "I talked to both Sony and 2K about it yesterday," said Levine, responding to a Twitter follower. "Trying to make a match." Levine's update is likely to disappoint the many Vita owners who had likely hoped to hear that there had progress made on a portable Bioshock. Sadly, it would seem that there hasn't been any forward movement for the project since Levine confirmed back in February that work would start the second "somebody starts signing checks." That being said, if 2K Games is reluctant to invest in a Vita title, it would arguably be somewhat hard to blame them. While Vita sales have improved in Japan following a region exclusive price drop, the handheld has not sold as well as expected, overall. That said, a high profile game like Bioshock could be just what the doctor ordered, so here's hoping we get more positive updates from Levine and friends in the future.